2014 was quite an eventful year in our industry. Apple finally gave in to the big screen but also teased us with the small screen of the upcoming Apple Watch, and even surprised developers with Swift. Google wasn’t quiet either, revealing their vision for the future of UI with Material design and tackling wearables head-on. 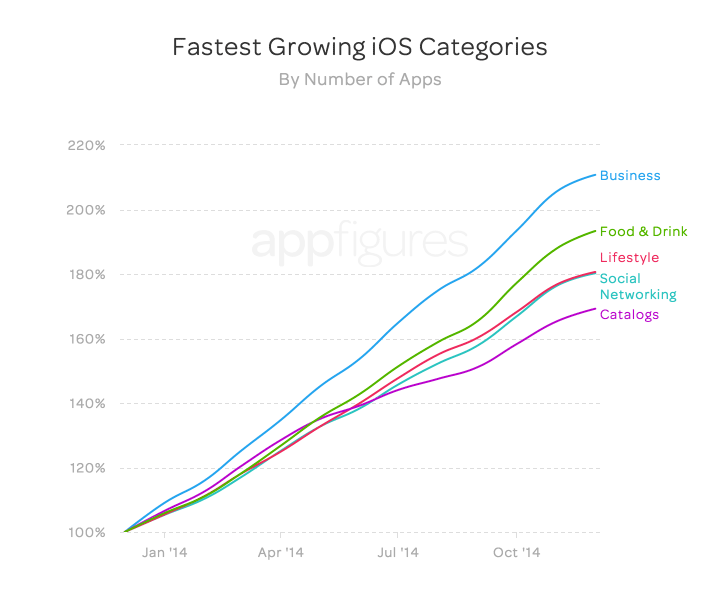 To celebrate such a great year, we’ll be taking a look at app store growth in 2014. In this report, we’ll be exploring the growth of each of these stores in 2014, but let’s start by establishing a baseline of how big each of the stores are, in number of apps, and how they got to where they are today. Looking at the chart above, we can see all three stores really expanded their app catalog. It’s the kind of healthy growth you’d expect from a relatively new industry. The most obvious takeaway here, however, is that Google finally closed the gap and actually jumped ahead of Apple, ending the year with more than 1.43 million apps compared to 1.21 million. 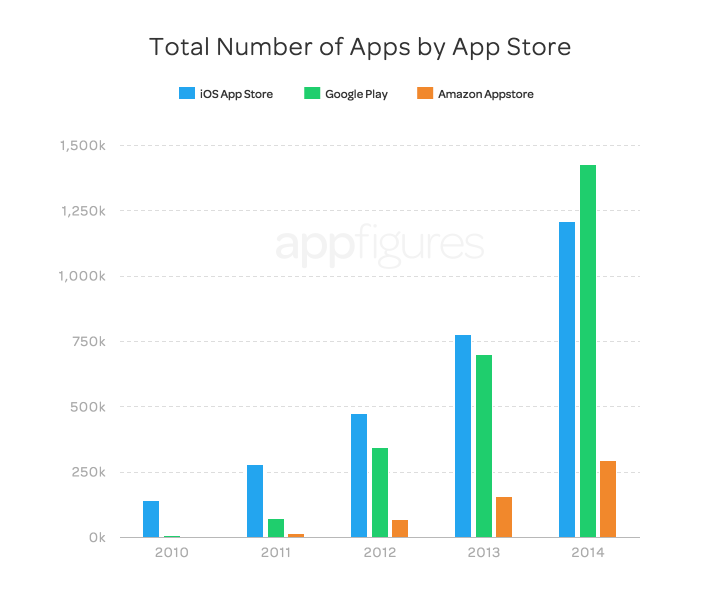 Amazon, although a distant third, grew its catalog by nearly 90% to 293k apps. Looking at the number of app developers who publish apps for the different stores, we see a familiar picture. 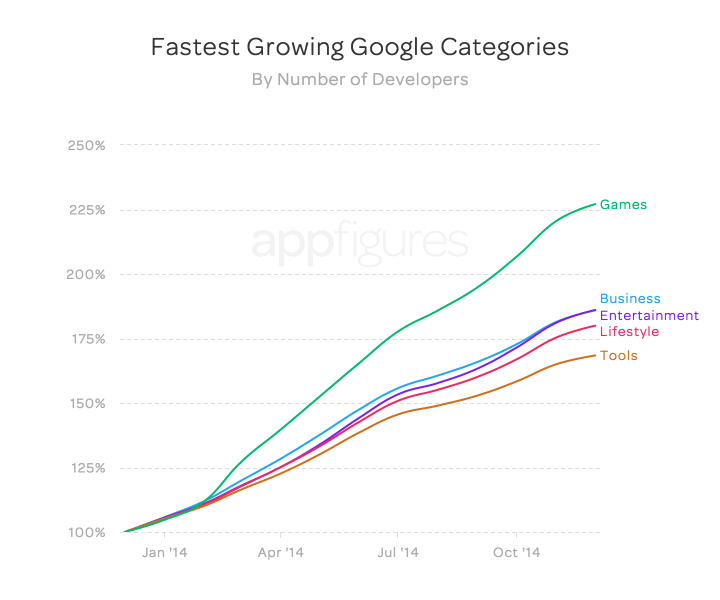 Google Play’s developer community grew tremendously in 2014, exceeding Apple for the 3rd year in a row. In fact, Google Play is distributing apps from nearly 400k different developers. This is a much higher number than what we observed in last summer’s report on app developers, meaning the Play store saw rapid growth in the last two quarters of the year. App development is certainly on the rise and the platform doesn’t seem to matter. In 2014, all three app stores grew by at least 50% (by the way, when we say growth we mean the percent change from the end of the previous year). What’s interesting is that although Apple continues to grow strongly, it’s really Google Play that’s growing. 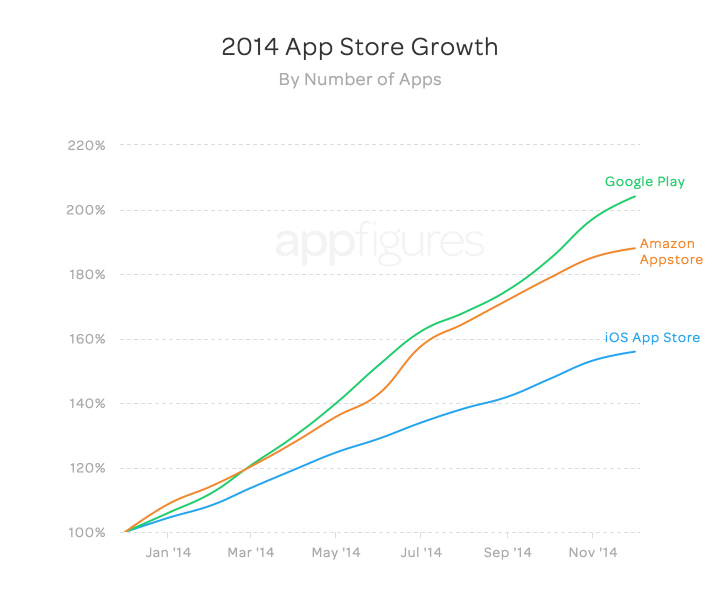 In 2014, the number of apps distributed through Google Play has doubled. Amazon is also enjoying impressive growth, albeit from a much smaller base. We expected to see Business and Games rank very high as both are fairly mainstream, but Food & Drink, with the second largest growth, was certainly a surprise. Keep in mind, for the comparison to be apples to apples, these charts look at growth and not total size. On Google Play, Games are in abundance with the category more than doubling in size. Interestingly enough, although tiny in comparison to Games, the Photography category saw abnormal growth in 2014. Selfie Stick anyone? This is surely amazing growth, but are those new apps being published by new developers, or is the catalyst for this massive increase in apps a result of incumbents expanding? You’re about to find out. 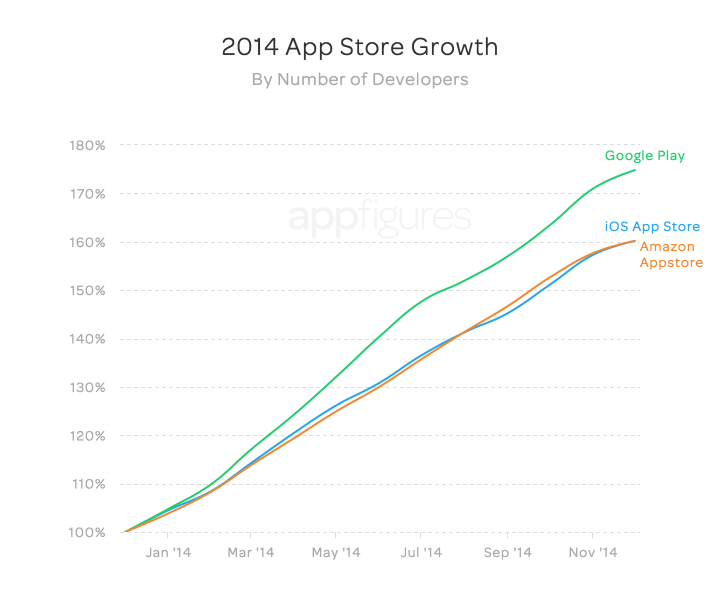 More developers released apps for Google in 2014 than Apple and Amazon combined! More developers joined Google in 2014 than Apple and Amazon combined! 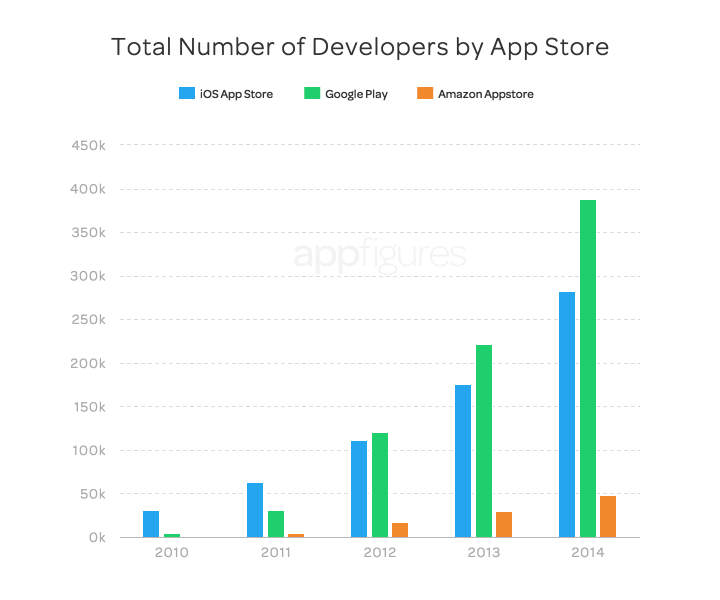 With developers flocking to Google Play, the store has reached a new milestone: 388k developers — more developers than Apple (with 282k developers) and Amazon (with 48k developers). We can see the relationship here between app growth and new developers, with most new Apple developers publishing business apps. What’s interesting is how games started off slow and sped up around March, catching up with the steadily growing lifestyle category. It’s no surprise that Apple developers, much like their Google counterparts, are focusing on mainstream apps. 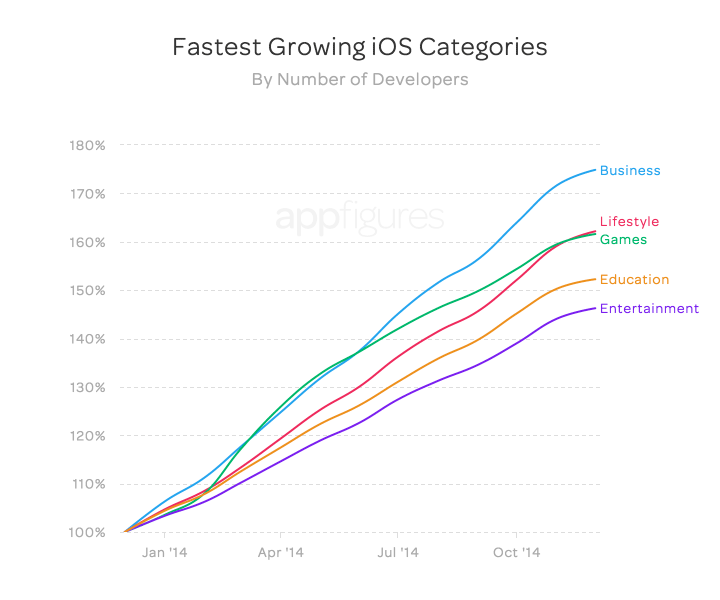 The amazing growth in games we mentioned earlier correlates directly to developers. The category saw the highest number of new developers, more than the business and entertainment categories that are tied for second place. There you have it, a whole year of amazing growth by the numbers. 2014 was certainly the year for Google Play growth. Kudos to the teams who run the store and help developers! With the most apps and largest developer community, Google Play is starting the new year with a kick. Market fragmentation and varying device capabilities don’t seem to detract developers from making Android apps. But, with the upcoming Apple Watch, Swift, and a larger screen, Apple is giving developers a lot to be excited about. This analysis was done using our comprehensive app catalog which we make available commercially through Appbase. The catalog contains deep meta data for more than 4 million apps from all major app stores. Where’s the graph showing $ paid to developers? Still thinking that app development have to be paid at a certain point, moreover that often great apps are from small teams. From a dev point of view i would focus on revenue more than users. developers are like any producers around the world. They produce but someone else earns the fruit of their labour, almost without doing anything BUT speculating and taking advantage of stock exchanges. Farmers (small) are the perfect exemple of forgotten producers. They hardly earn their living. You sound like you have issues (probably fantasizing about android too much? ), and you need help. Stop jumping on every thread and comment where android is being overlooked or overseen by iOS. Users like me and many others are the reason why we prefer using iOS devices. Instead of you flaming every single one in here maybe you should save up instead of buying “luxuries” and take a course in maners or something, smh. You don’t have to keep saying android is better and Google is God, to me android is crap, and Google is just as good as a search engine. iOS developers made $10B last year, Apple made $4.5B fom App store with their cut. Google profited $4B from Play Store but no word yet on what developers made, likely less but is growing. You forgot Windows / WP store(s). Can’t take this seriously. window$ is HALF google figures!!! Can’t take your opinion seriously, you’re right! Wow, spelling Windows with a dollarsign, how mature. True they achieved in very less Time than these two. Last thing I published on Droid/iOS/Windows worked like this. For each 100 sold on iOS, I got 14 on Android and 0.4 sales on Windows. The real challenge Microsoft is facing isn’t really with its platform but rather with its audience. Windows phones and tablets haven’t _really_ made it into the mainstream just yet so the distribution pipe is tiny in comparison, explaining trends like what you’re seeing. We didn’t _forget_ about Windows. While it saw some interesting growth in 2014 we decided to focus on the major platforms, and Microsoft just isn’t there yet. Yes, a small team, but our revenues from iOS are x 3 in 2014 compared to 2013.
zero x 3 = zero x 10,000 = zero… OK! Apple wants to sell LUXURY, only for those who can AFFORD our apps… BUT IT deceives ONLY THE FLOCK OF steve job’s fans… that’s it! VIVA ANDROID! can you name the app you are referring to? Althougt there are more apps in Google, people pay a lot more in Apple. That gap is closing fast. Android expected to pass iOS in revenue in a couple years as well. Apple will always lead in hardware revenue though. We publish in both Android and iOs but the Android sales stay firmly about 10% only of the iOS sales ..
welsh national anthem ? What’s the difference ? That would certainly be an interesting analysis. Thanks for the suggestion! Very good insights on mobile trends and the increasing importance of Apps. We collect deep information on apps from all major app stores. Can you update this report? Interesting Oct’14 – Sep’15. Thank you in advance.